^ Fredholm BB, Abbracchio MP, Burnstock G, Dubyak GR, Harden TK, Jacobson KA, Schwabe U, Williams M (1997). “Towards a revised nomenclature for P1 and P2 receptors”. Trends Pharmacol. Sci. 18 (3): 79–82. doi:10.1016/S0165-6147(96)01038-3. PMC 4460977. PMID 9133776. ^ Fredholm BB, IJzerman AP, Jacobson KA, Klotz KN, Linden J (2001). “International Union of Pharmacology. XXV. Nomenclature and classification of adenosine receptors”. Pharmacol. Rev. 53 (4): 527–52. PMID 11734617. ^ Haskó G, Pacher P (March 2008). “A2A receptors in inflammation and injury: lessons learned from transgenic animals”. Journal of Leukocyte Biology. 83 (3): 447–55. doi:10.1189/jlb.0607359. PMC 2268631. PMID 18160539. ^ Kalda A, Yu L, Oztas E, Chen JF (October 2006). “Novel neuroprotection by caffeine and adenosine A(2A) receptor antagonists in animal models of Parkinson’s disease”. Journal of the Neurological Sciences. 248 (1–2): 9–15. doi:10.1016/j.jns.2006.05.003. PMID 16806272. ^ Fuxe K, Ferré S, Genedani S, Franco R, Agnati LF (September 2007). “Adenosine receptor-dopamine receptor interactions in the basal ganglia and their relevance for brain function”. Physiology & Behavior. 92 (1–2): 210–7. doi:10.1016/j.physbeh.2007.05.034. PMID 17572452. ^ Schiffmann SN, Fisone G, Moresco R, Cunha RA, Ferré S (December 2007). “Adenosine A2A receptors and basal ganglia physiology”. Progress in Neurobiology. 83 (5): 277–92. doi:10.1016/j.pneurobio.2007.05.001. PMC 2148496. PMID 17646043. ^ Cunha RA, Ferré S, Vaugeois JM, Chen JF (2008). “Potential therapeutic interest of adenosine A2A receptors in psychiatric disorders”. Current Pharmaceutical Design. 14 (15): 1512–24. doi:10.2174/138161208784480090. PMC 2423946. PMID 18537674. ^ Peart JN, Headrick JP (May 2007). “Adenosinergic cardioprotection: multiple receptors, multiple pathways”. Pharmacology & Therapeutics. 114 (2): 208–21. doi:10.1016/j.pharmthera.2007.02.004. PMID 17408751. ^ Cohen MV, Downey JM (May 2008). “Adenosine: trigger and mediator of cardioprotection”. Basic Research in Cardiology. 103 (3): 203–15. doi:10.1007/s00395-007-0687-7. PMID 17999026. ^ Ferré S (May 2008). “An update on the mechanisms of the psychostimulant effects of caffeine”. Journal of Neurochemistry. 105 (4): 1067–79. doi:10.1111/j.1471-4159.2007.05196.x. PMID 18088379. ^ Osadchii OE (June 2007). “Myocardial phosphodiesterases and regulation of cardiac contractility in health and cardiac disease”. Cardiovascular Drugs and Therapy / Sponsored by the International Society of Cardiovascular Pharmacotherapy. 21 (3): 171–94. doi:10.1007/s10557-007-6014-6. PMID 17373584. ^ Baraldi PG, Tabrizi MA, Gessi S, Borea PA (January 2008). “Adenosine receptor antagonists: translating medicinal chemistry and pharmacology into clinical utility”. Chemical Reviews. 108 (1): 238–63. doi:10.1021/cr0682195. PMID 18181659. ^ Cristalli G, Lambertucci C, Marucci G, Volpini R, Dal Ben D (2008). “A2A adenosine receptor and its modulators: overview on a druggable GPCR and on structure-activity relationship analysis and binding requirements of agonists and antagonists”. Current Pharmaceutical Design. 14 (15): 1525–52. doi:10.2174/138161208784480081. PMID 18537675. ^ “Entrez Gene: ADORA2A adenosine A2A receptor”. ^ a b Jacobson KA, Gao ZG (2006). “Adenosine receptors as therapeutic targets”. Nature Reviews. Drug Discovery. 5 (3): 247–64. doi:10.1038/nrd1983. PMC 3463109. PMID 16518376. 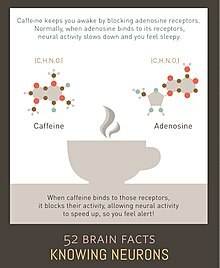 “Adenosine Receptors”. IUPHAR Database of Receptors and Ion Channels. International Union of Basic and Clinical Pharmacology.